For the second week I have chosen the theme, One State and three cuisines.Well I naturally chose Gujarat.Time and again I have written about Food from Gujarat. This is the state which has foodoholics and has a vast variety of food. Each region has its own specialty and for today I have chosen to cook from Surat, which is famous as a diamond hub. Surti food is popularly known as Surti Jaman. This region has a fertile soil as such fresh green vegetables and fruits are available in plenty. The diet consists more of bajri in winter and wheat in summer. Surti cooking is characterized by the use of green chillies rather than red chilly powder. The vegetable preparations thus retain their green color. This is just the beginning of the season, so I could not get those lush green seeds, else the color of the dishes is very very green. The famous Surti vegetable is the Undhiyu, a mixed vegetable prepared only in winter, flavored with fresh coriander and garlic. 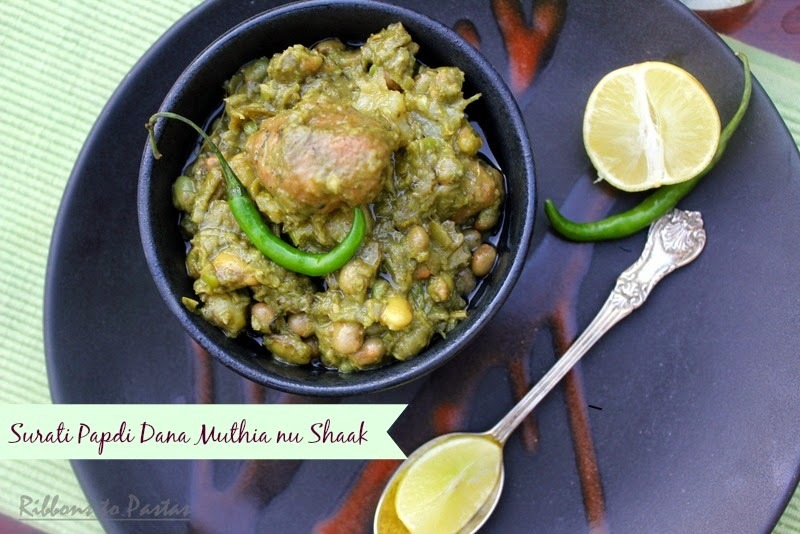 For today I have made a mini version of Undhiyu, called Dana Muthia nu Shaak. This is a dish which is made very regularly in our house , and somehow always in bulk. My hubby and rest of the family are quite fond of it , also when ever I make this I pack for a few friends and my daughter. While making this if you do not get papadi you can make Dana Muthia also, the taste is as good.I have used two kinds of seeds, the fresh pigeon pea , called tuver and broad beans called Vaal . You could serve this with either Poori, roti or rotla. String the papdi and break it into pieces. Heat oil in a pressure cooker and add ajwain and asafoetida. Add the washed danas and papdi. Add a pinch of turmeric and salt. Add enough water for the veggies to cook. Add the paste and cook till all the moisture has gone. Add the rest of the spices and the prepared Muthia and fried or boiled potato. Add little water and let the veggies and Muthia cook till Muthia is soft and oil starts leaving sides.